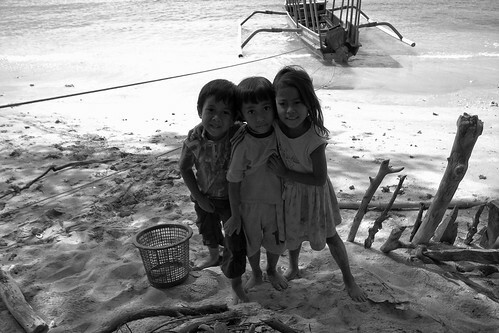 I left Gili Trawangan on Wednesday morning to take the island hopping boat to Gili Meno. I had booked a room online at the Tao Kombo, but when I got here, they hadn’t read their email, yet. I soon understood why. There’s only one internet place on the island. It’s right inland, very small and the connection is horribly slow. 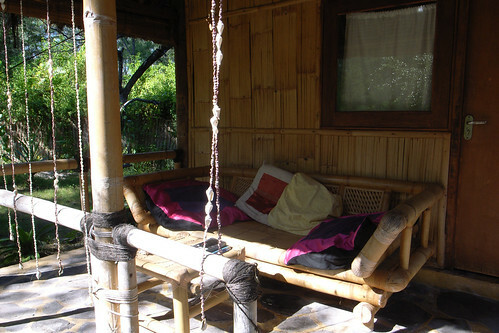 Anyway, the room I had booked, a sleeping platform (beruga) with bamboo blinds, basically, was not available. But there was a bungalow I could take if I wanted to. Strangely enough, the bungalow was the same price I expected to pay for the beruga, as I had to pay for 2 people even if I only needed space for myself. The bungalow is wonderful. 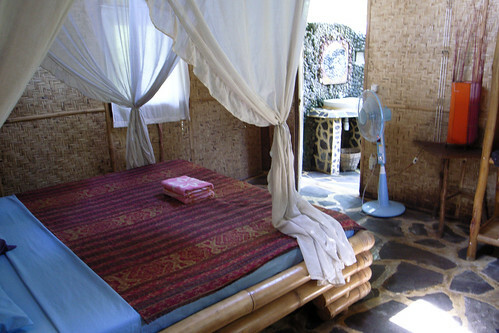 It has a fairly large room with a queen size bed, mosquito net, a shelving unit, a little table with a lamp, a fan and the bathroom is in the back. Open! Really cool. It is very hippy-ish. There’s also a gecko in the room. When I first saw her, I completely freaked out. I had been to the Tao Kombo bar and had had 2 Bintangs and I felt slightly tipsy. I had to go to the bathroom and as soon as I turned on the light, there were a bunch of little frogs jumping up and down, trying to make their way out. When I came back to the room, I saw this huge lizard on the wall. She’s about 20 cms long. 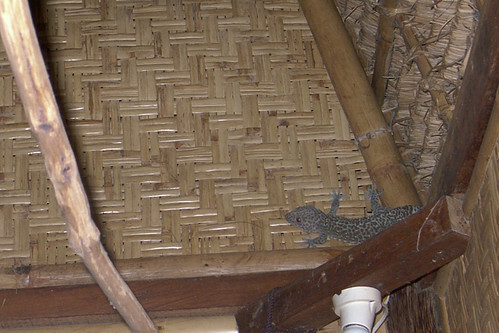 I didn’t know what to do, but I was so freaked out, I went to the bar and said there’s a gecko in my room. They all laughed at me freaking out. She lives here and is apparently a sign for good luck. I see her now and again. Usually not during the day, but at night she’s here. Though one morning she was on the wall very close to me and woke me up with her very loud barking. I must admit, it was slightly unsettling but I’ve grown to like her. I even bought a little necklace with a gecko, for good luck. 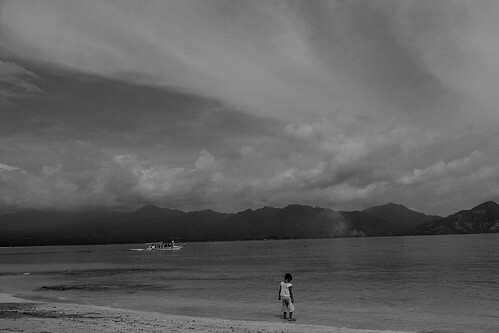 I haven’t done much here in Gili Meno. 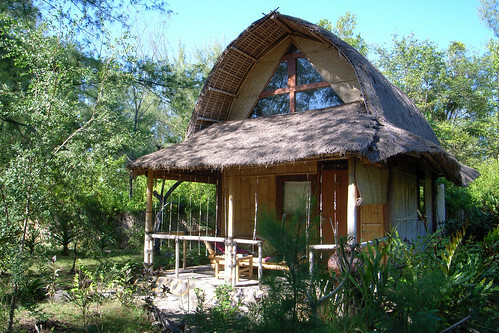 The Tao Kombo compound is wonderfully secluded in the jungle. It’s about a 300 meter walk to a very good beach but it’s lovely hearing all the birds and chickens that run freely here. 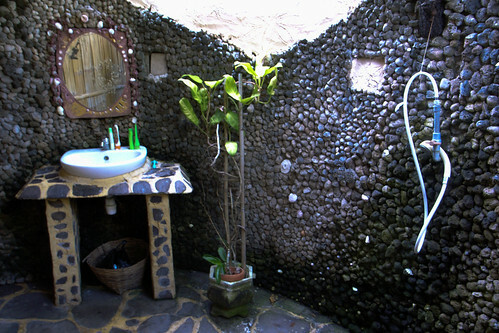 There’s 5 bungalows and a few berugas scattered around a large garden and there’s a great bar with mellow tunes at night. This place is so very different from Trawangan. It’s not at all built up. There’s one general store where you can buy pretty much all you need, but there’s no swanky restaurants, bars or clubs. There’s nothing going on here and it’s great. I took a walk all around the island a few times now and there’s long stretches of beach with nobody there. There’s little ‘warung’ (very basic little restaurants) scattered all along the coast, but mainly the east side, where I am.. I’ve had some really great food here; gado gado (veggies in peanut sauce), nasi and bami goring, a local dish with veggies in coconut milk (forgot the name). Very cheap, too. Today, my lunch (the local dish with rice) cost me less than $1.50. There’s lots of cool, cheap places to eat here. Most of them serve Indonesian food and a few western dishes. I was surprised to see that French fries with mayo is often on the menu here. I have decided to stay here til I have to go back to Bali on Thursday. 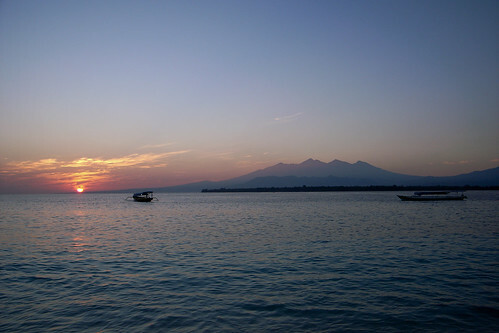 I will take a daytrip to Gili Air (the last of the three ‘Gilis’) but won’t spend the night there. I love Meno so much, especially because it is so super chilled out. The people are nice and it’s way less commercialized than Trawangan. But I guess maybe 10 or 15 years ago, Trawangan must have been like this. So really, no adventures from here. I basically eat, sleep, drink and chill out on the beach here. That’s all there is to do. Wonderful.